Artist and author Martynas Noreika investigates the life and writing of Antanas Škėma, whose soon-to-be published novel The White Shroud was first published in Lithuania. 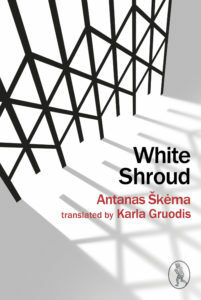 Set in 1950s New York, The White Shroud’s narrative centres around the struggle of émigré poet Antanas Garšva to adapt to life in a completely different, and ultimately indifferent, modern metropolis. By far the most popular image that comes up if you Google Antanas Škėma is a black and white headshot, fully in keeping with the aesthetics of Hollywood’s golden age, in which it’s hard to say what’s more coiled: the sensuous, swirling grey plumes of Marlboro smoke framing his face; or his smile, a sneer the likes of which Oscar Wilde would be proud of, to say nothing of the cravat. It’s posture, sure, but nevertheless he looks comfortable, at peace in his new home. Fully integrated. Though I missed out on the good looks, I’ve got a few things in common with the man in the photo. I was a foetus during my country’s Singing Revolution of 1990 and (if you’re talking to my dad) took my first ever steps in the shining dawn of a newly independent republic. One way or another we didn’t stay long. Spurred on by enthusiastic success-stories of emigration to the UK and beyond, my parents moved our fates to London in the early nineties. They brought elements of their history and culture with them and strained to keep the language alive in me and my brother. Yet despite their efforts, I grew up a mere semi-bilingual member of the Lithuanian diaspora. At university we were encouraged to read far and wide across our interests and taught to see artworks as orphans: forever ready, willing and anxious to be adopted to the needs of any new circumstance. Since I always had room for the Modernists, it’s not much of a coincidence that many a late night, what-the-hell-should-I-read-next Wikipedia dérive would end up in front of Škėma’s Magnum Opus, White Shroud (Balta Drobulė, 1958). Time and again I’d stumble across references to the novel, but since all of my reading and formal education was conducted in English, any command of Lithuanian I still had was exclusively spoken. Whether I could get my hands on the text or not was irrelevant, as no English translation existed. It’s now maybe a little unfashionable (and I can’t remember where I first heard it stated like this) but I’ve always felt an affinity with the more classical model of reading: an idea of the reader as an amateur musician. Someone who sits down at the piano or whatever and has some music by somebody they don’t personally know and cant possibly measure up to, and they have to use their skill to play the piece. The more you put yourself into a text, the harder you practice, the better your experience ultimately is. You can read well or you can read badly and in a work like this, being able to understand the words doesn’t immediately get you so far. That being said I definitely don’t mean to put anyone off. The book is beautiful and well worth the effort. Many of my favourite pieces of Modernist art intentionally exclude faraway utopias or divine realms. Instead, they’re often about considering the familiar with an unusual vigour and sincerity, looking at specific experiences in everyday life. Škėma’s character Antanas Garšva – no prizes for guessing who he’s based on – is a struggling émigré poet working a menial job as a lift operator in a large New York hotel. He notes every passing detail, counting each individual coat hook (ask any aspiring artist: in a dull job you count everything, not just the clock). Good, judicious narrators recognise that lives can be meaningful even when they involve a lot of failure and humiliation, and much of the novel chronicles the transformation Garšva undergoes inside the shaft, going up and down in an enclosed room and feeling increasingly unwell, whilst selling the one commodity he has: his time. Though Škėma occasionally flirts with narrow-world existentialist notions, namely the absurd condition of man as plotting his course without adequate reason or insight, the novel is generous and multifaceted, with every aspect of Garšva’s life handled with honesty and focus. Škėma had a good sense of how demented and fragile we all are deep down, and existentialism’s tragic dimensions of human existence come in the end only to inform the passages in the lift. For his protagonist, the act of writing poetry is more than a reaction to the banality of everyday life: it’s a passionate desire to overcome death through self-expression. The poet wants to leave his mark on the history of literature and believes deeply in the logic of his craft. The narrative shifts back and forth with frequent digressions to Garšva’s past, accessed by the reader through diary entries and standalone vignettes, brief chapters that express the artist’s inner-reflections or provide insight into the events that made him. After all, the book seems to suggest, beliefs are like loyalties: they’re only really meaningful when they’re tested. If the world is meaningless and it’s merely our delusions that drive us, are they really all that bad? A particular joy for me was the dialogue, much of it featuring a kind of corrupted English émigré slang. I smirked like Škėma’s portrait whenever I encountered these in the text, as they brought back fond memories of my own family home and upbringing. Bilingual households tend to have a slippery, entirely natural overlap between tongues as they’re often spoken in tandem. I can’t imagine that translating anything is ever easy or straightforward but with this novel in particular, let’s just say I have a huge amount of respect for the people involved. My basic grasp of the language meant that I could imagine how certain passages might sound, and in the resulting rhythm, constitute to a kind of independent meaning. While I’m sure that carrying this through to the translation would have been impossible, I nevertheless thought about the novel as an experiment with the musicality of language itself. The definition of what a ‘Changeling’ is as put forward by this publisher couldn’t be more apt. It’s a different animal. On my second read-through I followed the text along with the original Lithuanian on audiobook and was thrilled at how melodic it sounded. Packed with onomatopoeic, jagged prose and angular chords, descriptions dependably rendered in high style; sonorous gems everywhere, regardless of subject matter. Škėma’s tone simultaneously lyrical and coarse yet always managing to flow, at times reminding me of the tumbling meter of Ginsberg and the Beats. Thanks to this translation, I felt doubly privileged to have been able to listen to the book as well as read it. Martynas Noreika is an artist and writer based in Glasgow. He studied at the Slade School of Fine Art in London and is currently working on his first novel. Škėma’s novel The White Shroud will be published on 26 October by Vagabond Voices priced £10.95. This edition is translated by Karla Gruodis.